Pathology in Marine Science contains the majority of papers presented at the Third International Colloquium on Pathology in Marine Aquaculture held in Gloucester Point, Virginia, USA in October 1988. 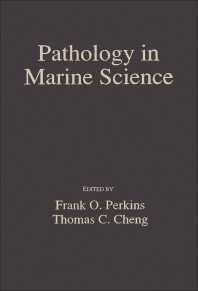 The book serves as a record of the progress of concerted research in marine pathobiology and also as a useful reference tool. The compendium consists of contributions that are reflective of the subdisciplines of the biological sciences that are of immediate concern to investigators interested in pathology in marine aquaculture. Topics discussed include viruses, bacterioses, mycoses, protozoan diseases, metazoan parasitic diseases, toxicological syndromes, teratological and neoplastic diseases, epidemiology/epizootiology, nutritional pathology, and immunology. Marine scientists, aquaculturists, and researchers on marine life science will find the text useful. Viroses. Bacterioses. Mycoses. Protozoan Diseases. Metazoan Parasitic Diseases. Toxicological Pathology. Teratological and Neoplastic Diseases. Epidemiology/Epizootiology. Nutritional Pathology. Immunology. Marine Research Institute, Charleston, South Carolina, U.S.A.